Invasive, exotic lionfish have infiltrated the waters at Biscayne Bay National Park and elsewhere in South Florida. The competition encourages members of the public to submit photos of captured lionfish in hopes of snagging one of 150 "Lionfish Control Team" t-shirts. Photos can be submitted via Twitter or Instagram using the #FWCLionfish tag. The interactive lionfish "hunt" is another example of the state agency using social media and crowd sourcing as a means to bring public and media attention to high-profile invasives. Earlier this year, the FWC-sponsored 2013 Python Challenge caused a stir in national media, earning headlines from the likes of VICE and New York Times, among many others. While perhaps not as buzzed-about as the Burmese python, the lionfish certainly has been making headlines in recent years in South Florida. The venomous saltwater fish is native to the South Pacific and Indian oceans and has been "regularly recorded all along the east coast of Florida, with multiple observations throughout the Florida Keys," according to the FWC. Lionfish grow to about a foot long and are "predatory reef fish" that are known to target native Florida species. They also compete for food with important sport fish like grouper and snapper. Conservationalists and state agencies are concerned about their short- and long-term impact on Florida's already-threatened coral reefs. It isn't just about saving native species for the sake of conservation: A flourishing lionfish population could have a negative economic impact on valuable state resources. Recreational saltwater fishing of species like snapper and grouper on Florida's east coast "generated 29,000 jobs and $3.3 billion in sales" in 2011 alone, according to numbers from the National Oceanic and Atmospheric Administration (NOAA). Destroying lionfish has in recent years become a popular cause in the American diving community. The non-profit recreational divers organization Reef Education and Foundation (REEF) hosts annual lionfish derbies, doling out prizes to teams who collect lionfish in non-native habitats. The 2013 South Florida lionfish derbies are scheduled for July 27 in Fort Lauderdale, Aug. 17 in Palm Beach County, and Sept. 14 at John Pennekamp Coral Reef State Park in Key Largo. Marketing an invasive species could make it so popular that 'individuals would raise or release the fish' where they did not already exist...Dr. Philip Kramer (of the Nature Conservancy) is concerned that the marketing of lionfish might increase the number of traps on reefs, which could trap other fish as well. He said spearfishing was the sustainable way to catch lionfish. Additionally, the U.S. Food and Drug Administration late last month issued a draft guidance for seafood processors that warns of risks of ciguatera fish poisoning (CFP) in connection with consuming two species of lionfish -- Pterois volitans and Pterois miles. This draft is an update to a previously released guide on CFP, which is caused by consuming fish "that have eaten toxic marine algae." Cooking the fish won't kill CFP, which can handle high temperatures. 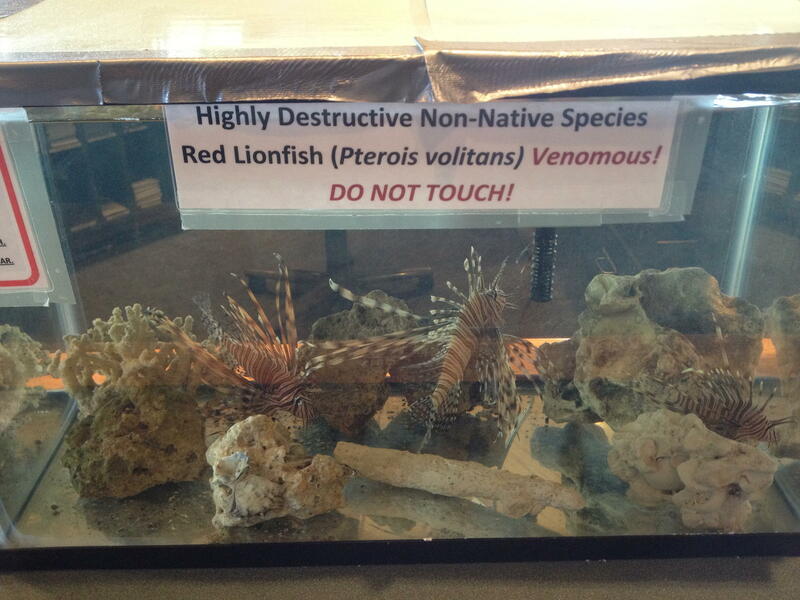 Lionfish have venomous spines and should be handled with great care. The FWC recommends spearfishing as the most effective method of harvesting the fish, but cautions fishers to beware of damaging coral reefs in the process. Lionfish are not well suited for hook and line fishing, but handheld nets are recommended. No fishing license is required to catch lionfish by spear or handheld net, but one is necessary if using hook and line. Lionfish harvesting is even allowed in the Florida Keys National Marine Sanctuary, though a permit is required. The FWC lionfish photo contest continues through April 30. All photos must belong to the entrant and no photo editing software may be used. Not comfortable "harvesting" a fish? Help scientists to track the lionfish problem by reporting sightings to the USGS. Fire ants are notorious Florida invasives, leaving a trail of painful welts and blisters in their wake. Those pesky exotic intruders also happen to be a serious threat to some of the state's most vulnerable endemic species. This includes the Florida grasshopper sparrow, which recently made the March/April cover of Audubon Magazine as "the most endangered bird in the continental United States." Python Challenge Hunter: "It's Eerily Quiet In The Everglades"
Tom Rahill knows the Everglades. He has been camping, hiking, clearing trails, and "hanging out" in Florida's River of Grass for an estimated 35 years. When he sweats, Rahill says he "even smells like the Everglades." A participant in the recently-wrapped and much-maligned Python Challenge, Rahill recognizes that much of the press and public appear unimpressed with the contest's final tally of 68 snakes. As Mike Perez mingled with visitors at the recent Python Challenge awards event in Miami, his left arm supported the weight of a black-and-white lizard with a body as thick as a linebacker's bicep. Gazing through heavily hooded eyes, the lizard rarely moved, save for sticking out its forked tongue for an occasional sniff .